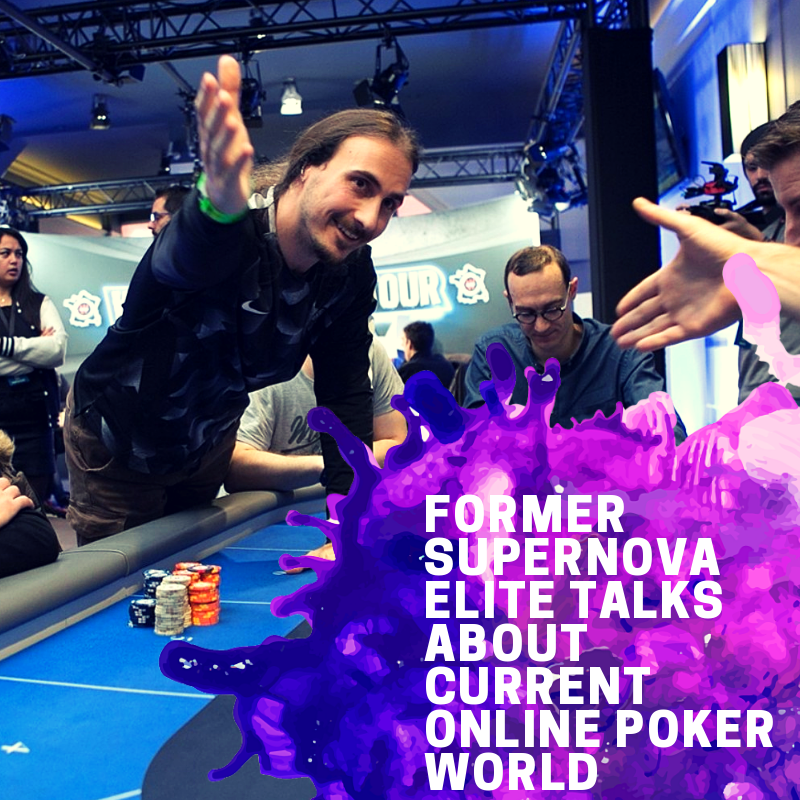 Slobodan Milosavljevic ”slobaks”, former Supernova Elite from Serbia, answers questions for YourPokerCash. He talks about the current situation in the online poker world and what it does it take to become an online poker pro. Today he is still playing, grinding the Spin & Go’s and MTTs. Hello Slobodan, thank you for taking the time for this interview! How did it feel to become the first and only PokerStars Supernova Elite in your country? Hello, thank you for inviting me! Reaching Supernova Elite I still consider as my biggest success in life, even today. If it’s not the biggest, it is the most important for sure, because it’s not something that brings you just money. When I became Supernova Elite I realized that sky is the limit and I gained extreme working habits. That title, except 7 stars under your name brought me much more than I could imagine. I experienced some really great stuff and I found a huge motivation. Did you have any backup plans ready when Supernova elite was canceled? What is it like to earn a living through poker today? Huh, that’s probably a dream of all players who like this game, to make living through this job. But that is much harder than they think. All in all, it’s not easy and nice how people think. It’s hard and every day this game becomes even harder. So, to live from this job is not so perspective like maybe it used to be before 4-5-6 years. How much can a competitive online poker player make? It depends on a game, format, and limits you are playing, and also depends on how many hours you are spending in front of your PC. For example, if you are playing MTT, you can reach some really big scores, but also you can face a downswing which sometimes can last for a few months or even longer. From the other side, if you are playing cash games, you don’t have an opportunity for a big score, but you will have a constant income every month. So again, it really depends on which games and limits you are playing and how much you are devoted. What are the challenges faced by online poker players? I think that most of the people don’t realize this is a job like every other. You have to work a lot and be ready for the grind. The game is really tough these days, and as I already said, every day it becomes harder and harder. So if you want to become or remain a successful poker player you also have to become better and better every day. That means a lot of studying and big-time grind. How do you prepare before an online poker session? First of all, I try to lay to bed as earlier as I can, but with this job, it’s not always possible. So, I try to get up by the noon. Then I have a breakfast, coffee with friends and after that, the grind begins. I have several sessions per day, and between them, I try to do at least one training or play basketball with my friends. This is very important for me because spending that much time sitting in front of screens demands physical activity. How do you remain involved with other people around you who have more conventional jobs or professions? Honestly, when I talk to my friend, I see who is satisfied and who is not with their jobs. And the terrifying fact is that there are much more of them who are not happy with their jobs and they have a lack of ambition. This is something that in the same time scares me and motivates me to work on myself every day, in order not to become one of them. In your perspective, where will online poker go in the next 5 years? To be honest, I really don’t know. I see that the game is becoming more and more popular all around the world, but as I said every day it is harder to play. Very good players are appearing at the tables every day. I don’t know what will happen even in some shorter period. How much do you enjoy playing? Years ago when I started playing poker it was only for fun. I couldn’t imagine that poker will one day become my job. Later I found out that a lot of people make living with poker, so I decided to explore a bit. Now, after 8 years there is none of the fun in it. 🙂 Now it is a lifestyle, regular daily job which is at the same time similar to other jobs, and completely different and unique. How do you stay self-motivated to play? I find motivation all around me. I try to get up every morning and start my working day with great enthusiasm. I am lucky that people close to me are giving me a big support. Besides that, I try to make my working environment pleasant, because all that small details can make you happy there where you are. Of course, there are days when motivation couldn’t be found that easy, I have a couple of hobbies I really enjoy. I am a fan and collector of Jordan sneakers, old VHS cassettes, cinema wallpapers, vinyl, comic books, pinball etc… With poker, I manage to enjoy all these things much more, and small things make people happy. So, looks like that playing poker really contributes to your happiness? Just to make it clear, this job is very stressful. Your every click is one decision. If you make a lot of bad clicks, the day can turn into a real hell. I am really trying hard not to let poker affects my mood, but sometimes that’s impossible. But from the other side, poker brings me some really good things I was talking about in the previous question. And for the end, what would you advise to newbie players who would like to become professional online poker players? If you want to play poker for a living, you have to work a lot! You have to constantly improve your knowledge. If you can’t do it by yourself, there are a lot of staking and coaching houses out there for every format, which are looking for beginners, and I think you should use that opportunity. GL! Ok, Slobodan, thank you very much for your time! YourPokerCash wishes you the best both in your professional and personal life! 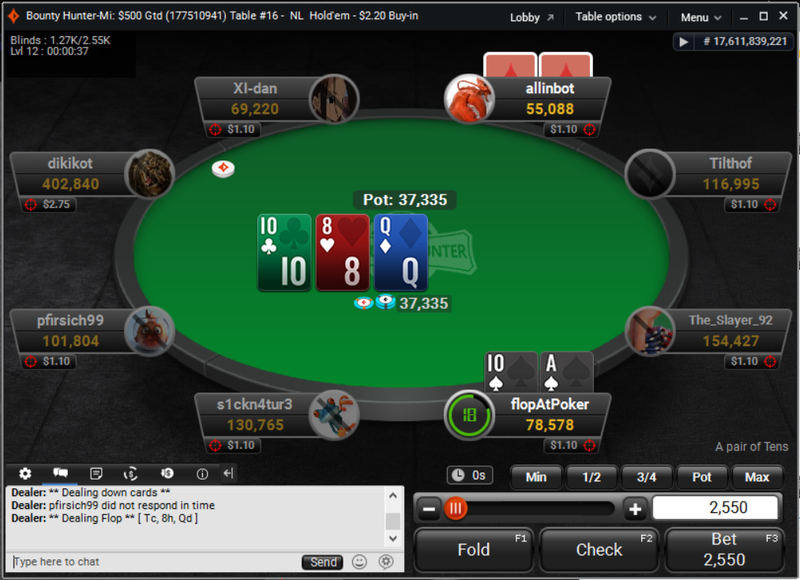 New partypoker software is now available, and it really looks much better. When you download the newest version you will notice a number of improvements to its poker client as part of the site’s latest desktop software update. The release provides greater options for players around table appearance and functionality and brings various gameplay enhancements. – Restyled Bet Slider that now incorporates the timebank. partypoker announced even more upgrades and improvements. Looks like they are giving their best to satisfy players. If you don’t have an account with partypoker yet, register until September 23rd and receive a 4 $5.50 satellite tickets for the biggest Powerfest series ever. partypoker announced new Powerfest series. This time it is a record breaker since the prize pool is incredible $60 million! As a result of great successes with previous Powerfest events, partypoker increased the guaranteed prize pool by 50%! There will be 670 events in 22 days with tournaments for everyone’s taste and bankroll. The events will be split into Micro, Low, Medium, High, High Roller and Super High Roller tires with buy-in range from $1.10 to$25.500. For at least 15 events prize pool will be $1 million. For the winners of all of 20 “Championship Events”, there will be individual trophies. The final day will have 3 events and a total prize pool of $6 million. And here you can find the full list of tournaments with dates, buy-ins, and all other details. And that’s not all! There will be side promotions during the event like happy hours and tournament leaderboards. More details will come up soon. Join partypoker and win some of the great prizes! If you sign up with YourPokerCash and deposit $10 or more until the 23rd September, you will get First Deposit Bonus 100% up to $500 + $22 ( 4 x 5.50 ) in free tickets to POWERFEST satellites. Gl! 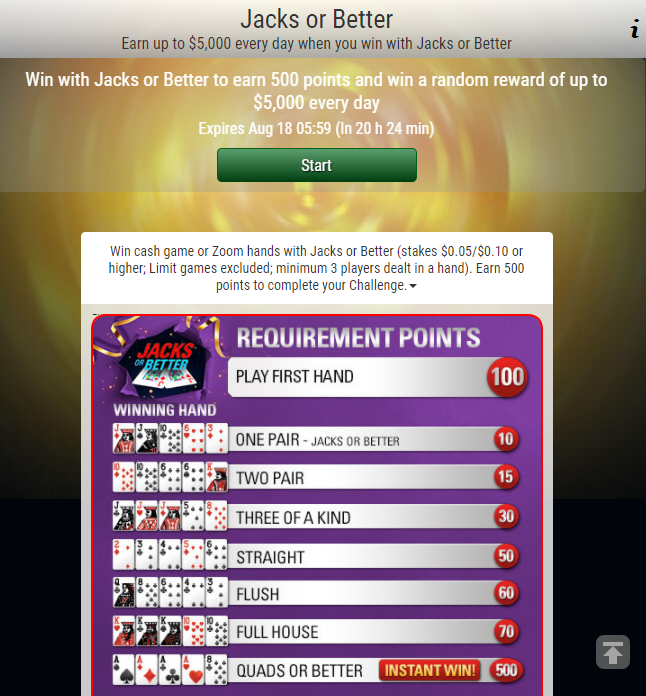 Jacks or Better Poker Challenge is a new promotion by PokerStars. This is a promotion with an invitation only. Check your e-mail and see if you are welcome! If you have received an e-mail with an invitation Opt-in! For a limited time, you could win up to $5,000 in cash every day. You will get cash prizes instantly and they are yours to keep. There are no restrictions or earning requirements. Play every day until August 29 to get a new reward each time! Open your Challenges window and hit ‘Start’ on the day’s Jacks or Better Poker Challenge. Play NL10 or higher Hold’em cash game (including Zoom) hands and every time you win a hand holding a pair of Jacks or better, you’ll accumulate points. Once you reach your points target (see below), you’ll instantly receive a cash prize of up to $5,000! We’ll even give you a 100-point head start when you play your first eligible hand of the day. Winning a hand with quads or better will see you complete the Poker Challenge instantly. You don’t have a PokerStars account yet? Join today with YourPokerCash and take advantage of our Welcome Bonus: First Deposit Bonus: 100% Deposit up to $600 *Bonus Code “STARS600”. Wanna play? partypoker casino is home to one of the largest poker networks. Consistently adding new slots, table games, and live casino platforms, you will never be disappointed. So, wanna play? Join today and enjoy both the welcome offers and the ongoing promotions! You can get paid up to $5,000 every week! Therefore, the more you play, the more they pay–literally! 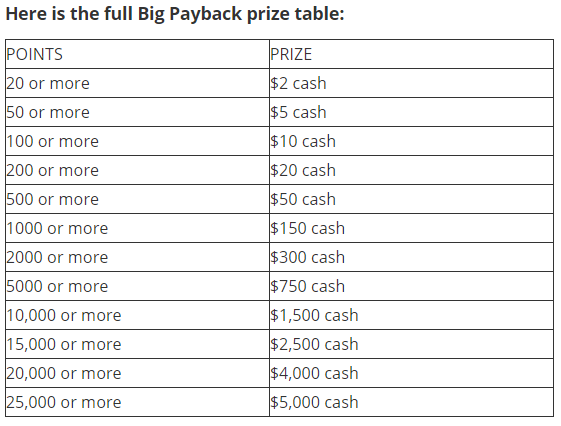 The Big Payback rewards pure cash every week based on the number of points you accrue while playing—up to $5,000 a week! –Jackpot Slots Giveaway where you climb the leaderboard and can win up to 500 spins! – Live Dealer Cashback each week – opt-in and you could see up to $/€/£50 land directly into your account the very next day! – Casino Rush Hour – It offers you the chance to earn a daily cashback bonus of up to $/€/£50 by wagering on your favorite mobile casino games! You can find all the details about the promotions here! 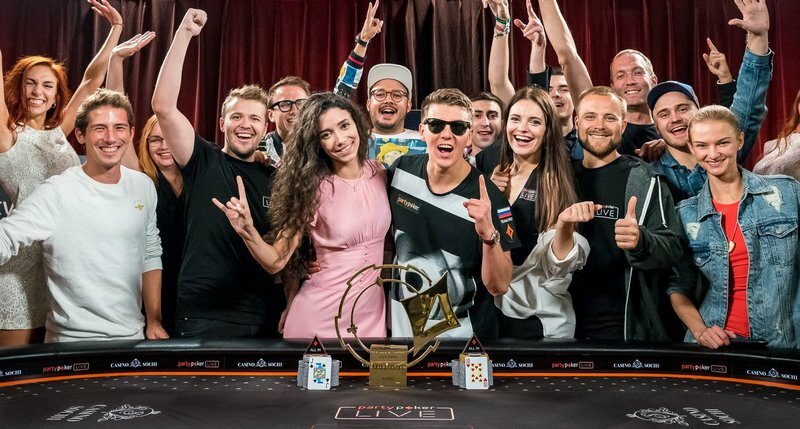 Anatoly Filatov is a winner of partypoker LIVE MILLIONS Russia Main Event. After defeating a field of 916 entries he took the Title and first place cash prize which is $900,000. A buy-in for this No Limit Holdem event was $5.023. For Anatoly Filatov, this is the largest score so far in his career. With winning this event, he now has more than $2.7M in lifetime tournaments earning. He is having a very successful year so far as this was the third final table for the young Russian poker pro. Kazaryan just limped the button with the Q 9 . Filatov decided to raise to 27,000,000 with J 10 and Kazaryan made the call. Q 9 7 came to the flop and Filatov checked. Kazaryan made a 35.000.000 bet and Filatov called. The K came on the turn making the nuts for Filatov who checked once again. Kazaryan bet 55.000.000, Filatov moved all-in and Kazaryan made the call believing that his two-pair from the flop could be good on that heavy wet board. 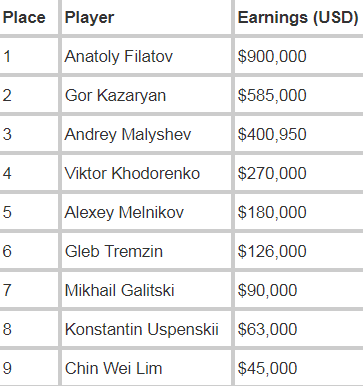 The river changed nothing and Filatov took the Trophy and $900.000, while Kazaryan won $585.000 as a runner-up finisher. World Championship of Online Poker (WCOOP) gives poker players across the world the chance to become a true, internationally-recognized champion at the game they love. This year, this prestigious series of great tournaments will take place from 2nd to September the 17th. With $70M in guaranteed prizes in WCOOP events alone, it’s looking to be the biggest championship yet. There are over 60 events on the schedule. Low, medium and high buy-ins for most events, with entry ranging from $2.20 to $25,000. Two Main Events, September 17: $55 buy-in with $1M GTD, and $5,200 buy-in with $10M GTD including at least $1M for first place! Phased Events, with combined guarantees of over $3M. Qualify for Phase 2 on September 16 in any Phase 1 tournament, running from August 12. 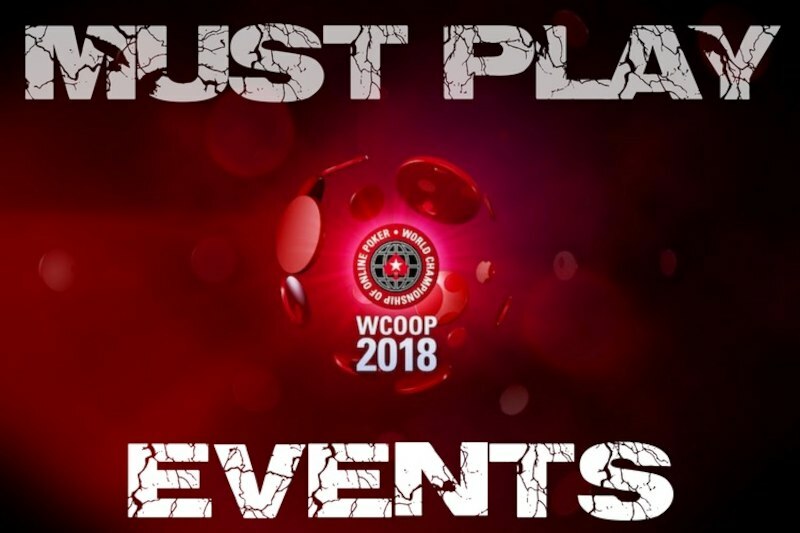 Special Spin & Go tournaments are awarding WCOOP entries, tickets and cash. Find them in the Spin & Go lobby, available for buy-ins of $5 or $25. Join PokerStars today and claim your 100% up to $600 First Deposit Bonus. Everyday $10.000 Freeroll is just a part of the great Seize The Crown Promotion by 888 poker. Scratch and win up to $500.000! Every scratch wins the cash! Every day until the 2nd October you can take your place at $10.000 Royal Crown Freeroll. Your first ticket you can win by simply logging to your mail and clicking on “Claim your FREE ticket“. Simply win a hand with a royal pocket pair in your favorite cash games or tournaments. Cash games: min stakes of 2¢ – 5¢; Tournaments & BLAST: min buy-in of $1. Royal cards refer to jacks, queens, and kings. Challenges are available to depositors only who have played in a $10,000 Royal Crown Freeroll at least once. Along with the $88 Free, 888poker is giving players 100% up to $400 deposit match bonus. Additionally to getting your first deposit bonus, you will also get 7 tickets to 888poker’s daily $500 Depositors’ Free Tournaments. Including 2 tickets to the $1,000 Depositors Free Tournaments. First-time depositors also receive a ticket to the “First Depositors’ Challenge Tournament” which happens every Friday at 19:00 GMT. The top 10 players get a seat at the Sunday Challenge Tournament! Your Welcome Bonus will be granted in $10 portions each time you collect 100 Bonus Points. Bonus Points are collected through playing real money poker and casino games at 888poker. Every week that you deposit at least once, you’ll get 2 additional tickets to $1,000 Depositors Free Tournaments. So you can play for free again and again! Finally, 888poker’s Monday Twins Challenge offers you the chance to double your winnings every Monday at 19:35 GMT for a $20+$2 Buy-in. Monday Twins Freebie: finish in the money in both Monday Twins Challenge tournaments on the same day and you’ll get seats to the following week’s Monday Twins Challenge tournaments – $44 value! FreeMonth of Sunday Challenges: make the final table in both Monday Twins Challenge tournaments on the same day and you’ll get seats to ALL of the following month’s Sunday Challenge tournaments – minimum$360 value! $1,000 cash: win one tournament and make the final table in the other on the same day and you’ll get $1,000 cash! $2,500 cash: win one tournament and come 2nd in the other on the same day and you’ll get $2,500 cash! $10,000 cash: win both Monday Twins Challenge tournaments on the same day and you’ll get $10,000 cash! In addition, take your chance to win some serious money for just a $13.20 buy-in. Furthermore, from fast-paced rebuy tournament action to slow burning deepstack challenges, there’s something for everyone and for every budget. Because 888poker is so great. 888poker encourages players to collect points for playing in a variety of challenges all leading to increased levels and Gold Tokens. Tokens can be redeemed for cash and prizes. 888poker puts in an eye-catching $100,000 in FREE Tournament guarantees! Join 888 poker today, check your e-mail and win the first ticket for Everyday $10.000 Freeroll! Play 10 Get One Free is a new Sit & Go Jackpot partypoker promotion which takes place this month. How does PLAY 10 GET ONE FREE work? Every Friday when you play 10 Sit & Go Jackpot 3-handed tourneys at one buy-in level in the same day, you’ll automatically win a ticket for an 11th tournament for free. 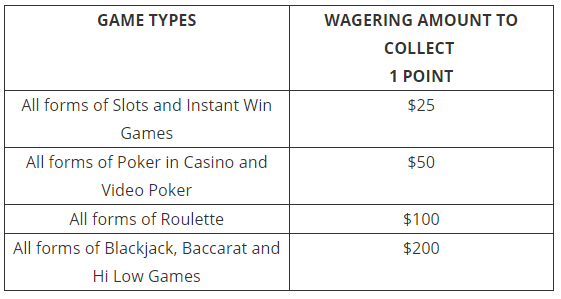 There are five buy-in levels -$0.25, $1, $3, $5, and $10. That means you can win up to five free tickets a day—one for each buy-in level! For an example, play 10 $5 SNG Jackpots a day and you won 11th buy-in for free. If you don’t have an account with partypoker, join it today with us today! And here you can see all the benefits you get with us!